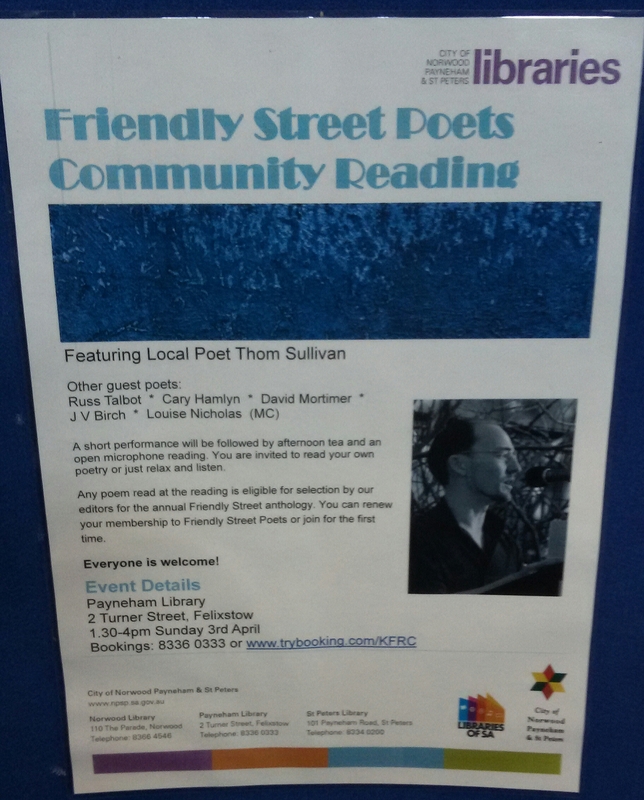 I was one of five guest poets invited to read at Payneham Library yesterday as part of the Friendly Street Poet readings and it was a fab line-up – with Thom Sullivan headlining backed up by Cary Hamyln, David Mortimer, me and Russ Talbot, all introduced by the charming Louise Nicholas. Anyhow, Thom kicked off still basking in the glow of his reading at the Adelaide Writer’s Week a few weeks ago. Thom reads well, there’s a certain quiet strength about him with which he captures his audience and what particularly stood out for me was Thom’s acknowledgement that we poets stand on the shoulders of greats, a responsibility we all share, a profound statement. Thom shared poems he wrote during last year’s National Poetry Month, including ‘Crow poem’ and ‘Living in a draught, which can be found here on his blog. Next up was Cary who, although not new to the poetry scene, confessed she has not given many readings (like me!). Cary read from her new chapbook Scraping the night, part of the Picaro Poets series published by Ginninderra Press and began with the title poem, followed by ‘Moment of departure’, ‘Time is a hound’ and ‘Future prince’ to name a few, with the titles alone enough to pull you in. Cary’s poems left me with some very vivid images but as said, more to follow about this shortly. David went up next, reading a selection of poems from his collections, including ‘No wonder’ and ‘Towards evening’ from Magic Logic published by Puncher & Wattmann. David, like Thom, is one of many amazing local poets here in Adelaide and is also adept in his delivery, finishing with a very clever poem about Keats and Wordsworth, who are considered to be part of the thousands of greats Tom referred to earlier. And then it was me. Louise did a wonderful introduction, mentioning my blog so I thought yes, better post about this event then(!). I opened with a new poem based on our Oodnadatta travels last October, a kind of sestina and probably the longest poem I’ve written to date. I then shared ‘Hoodlums’ recently published in InDaily, followed by three from my collection Smashed glass at midnight and ended with a poem I plan to include in my next collection I’m just finalising (yay!). Think I did ok.
Russ finished the guest poet line-up sharing work read by Jennifer Liston due to his acquired brain injury as a result of a brain tumour. I’ve never read any of Russ’s work before, it was breathtaking, as poems were read from his new collection Things that make your heart beat, also part of the Picaro Poets series from Ginninderra Press. And like Cary to be officially launched later this week, so I’m going to leave you hanging for the detail. After a short coffee break it was open mic time, where we heard the likes of Ian Gibbins, Martin Christmas (who was also happily snapping away), Judy Dally, Louise Nicholas (the MC) and Mike Hopkins, all of whom were highly entertaining. And there were a few first time readers as well whom the room applauded, something that happened to me at my first ever reading here, which is incredibly endearing and encouraging. So that’s it. I managed to sell, correction, the dazzling Jules Leigh Koch (who invited me to be a guest poet) managed to sell five of my chapbooks (which made my husband happy when I got home!) and I also had a lady approach me in the break to tell me how beautiful my poems were and how much she could relate to them, which I found very touching. All in all it was a wonderful way to spend a Sunday afternoon, set me up for the week it did.